There's still time to register for tomorrow's webinar, A Comprehensive Care Management Model: Care Coordination for Complex Patients, which will highlight AltaMed Health Services' phased approach to developing a comprehensive care management model to coordinate care for complex patients, including dual eligibles with chronic conditions. The first step in developing the model was studying the utilization patterns and the demographic make-up of the population, according to Shameka Coles, director, medical management, AltaMed Health Services Corporation, a 23-site, multi-speciality physician organization in Southern California that has been designated by the Joint Commission as a Primary Care Medical Home and is the largest federally qualified health center in the United States. 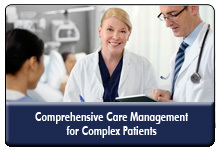 During A Comprehensive Care Management Model: Care Coordination for Complex Patients, a May 6th, 2015 webinar at 1:30 p.m. Eastern, Ms. Coles will share the key steps in developing this care management model, including details on how it was rolled out across its highest-risk patients and preliminary results achieved from this model. You'll also have the opportunity to have all of your questions answered by Shameka Coles during the interactive question and answer session. You'll get answers to your questions and challenges on developing an effective care coordination model for complex patients.